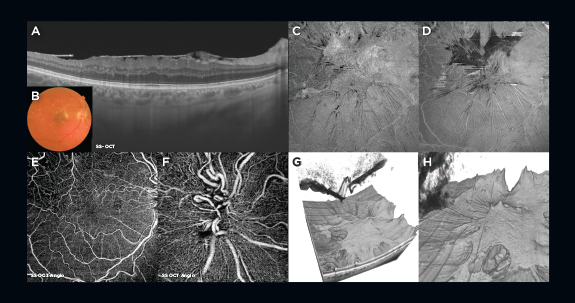 This case shows a patient with Eales Disease which led to recurring occlusive inflammation of the retinal veins as well as recurring retinal hemorrhaging. This in turn led to formation of large scale epiretinal membranes as well as tortuous vessels and ischemic areas. The patient was imaged using the Topcon® Triton™ Swept Source OCT with Swept Source OCT-A.1 The B-mode scan (Image A) shows the thick epiretinal membrane over the macular area. The Swept Source OCT-A images (Images E and F) show the tortouosity of the retinal vasculature around the macula and the optic nerve head. They also show peripheral ischemic areas in the upper temporal quadrant. The enface images (Images C and D), which were gathered from the structural images of the OCT-A data show the extent and location of the epiretinal membranes (Image C) as well as the pockets beneath them (Image D) which could be of assistance for surgical planning. The structural data was then exported and visualized in ImageJ/Fiji version 1.52e using the 3D visualization plugin. These 3D visualizations (Images G and H) also clearly show the location of the epiretinal membranes and the pockets. The density of the Swept Source OCT-A data is very valuable to visualize the subtle nuances of this case. The opinions, ideas, views and assumptions expressed are the author's own and do not necessarily represent the views of Topcon, nor do they constitute advice from Topcon. Submissions for the "Image of the Month" can be made at, topconmedical.com/imageofthemonth. Do you find the diagnosis helpful? Do you find the background information helpful? Do you find the images helpful? Is there a particular topic/pathology you would like to see featured in the future?